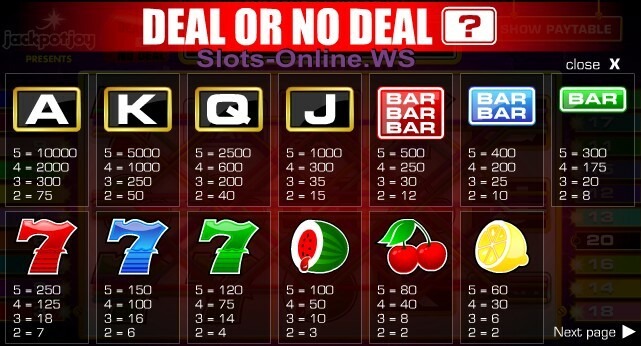 Deal or No Deal is a is an exciting 5 reel, 20 pay line slot machine based on the hit TV show. 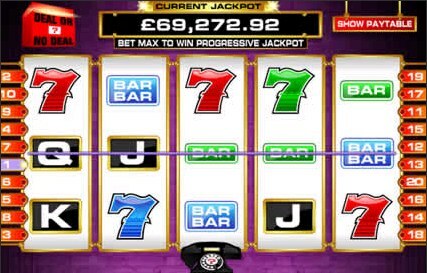 The slot features 3 bonus games and large progressive jackpot. Bonus round itself can make you 1/4 million British Pounds richer and captures all the drama and excitement of the popular show. Coin size can be set from 5p, 10p and up to 20p per coin, with each coin size game having its very own Progressive Jackpot. You must bet max, e.g. 20 coins per spin to qualify for the Progressive Jackpot. So for a bet from US$1 up to ?4 per spin you have an opportunity to win huge, up to $1 miliion and more jackpot. 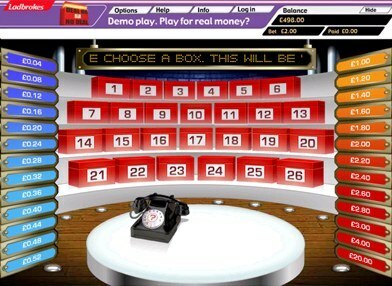 In Deal or No Deal you start by choosing the box to keep that you hope contains the big prize then select which of the remaining boxes to open, revealing their contents. The Banker will try to do you a good deal and buy your box with his offer. The choice is yours to deal or no deal - the longer you keep the big money in play the more The Banker is forced to increase his offer. Each box may contain from just 1p up to ?250,000. To find out you must eliminate the remaining 25 boxes one by one. On each stage you must decide whether to accept banker's offer, or carry on and hope that your box contains a larger amount, or that by eliminating some more smaller amounts, the banker might increase his offer. 3 Box Bonus Symbols on any paid line triggers the Mystery Bonus Round game where you'll pick boxes out of 15 sealed boxes with 11 cash prizes. Open a "Win All" box to win all 11 cash prizes! Empty box will stop the bonus round and return you to the normal slot game play. The game originated with the UK version on Channel 4, and is now watched in over 46 counties worldwide including: UK, USA, Canada, Australia, France, Spain, Belgium Greece, Israel and Hong Kong. Family Fortunes - Bonus Feature Multi Line Slot Machine. Mr Cashback - Bonus Feature 15 Line Slot Machine. The Right Prize - Bonus Feature 25 Line Slot Machine. Play All The Hottest Jackpot Slots At Brand New CAESARS Casino Online. The world's largest Casino brand now online! UK players can now enjoy..